I have just been checking out some of the awesome projects on the ScrapHappy Saturday link up and have concluded that I definitely need to put my back into this now. So far I have sewn my tiniest bits into little square-ish blocks and added some strips cut from my shirt stash (given my resolution to use these this year this seemed the obvious place to start). I think I know what next, but for now I haven't got much to show for my time. On the bright side, I love the shirt strips! Also, I've come up with a title for the blog post that I can use for months: just substitute the appropriate colour and bob's your uncle. There is lots of work in your arrangements. Pretty blues, variety of shades. Should make for some lovely finishes. You've got a great collection of shirts to use. I was gifted shirts, but they are all the same solid blue color. 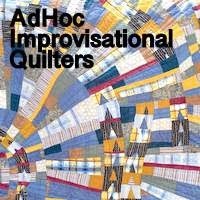 I am planning on making a quilt and gifting it back to the person who gave me the shirts. You've got a nice variety of BLUES in your stash! I hope you are having FUN with the RSC... I'm loving it! Nice squares, and I just love the shirt strips. Lovely blue stripes from the shirts and good idea to change the colour in your post each month. Sewing scraps is a slow work, but it's fun. And you've come up with the perfect title for the blog post. The shirt strips look like fun, as well as your squares. Looking forward to what you do with them all! Can't wait to see what those strips turn into... will they be sub cut and resewn....added to with other colors? Inquiring minds want to know! Looks to me like you are off to a good start. Scraps sewn together are more likely to turn into something than scraps in the bin. You've got a good start with the blocks and the strips. Keep up the good work! I also looked back at your posts and the staggered circles are fascinating. Looks like they are all KF. Putting your back into it is working! I especially like the shirt strips. Blue is my favorite color, as evidenced by the fact that I have twice as many blues as any other color. These have such a pretty contrast. Curious to see where they take you. Love love love these blocks. They have a such a relaxed feel to them. Looking forward to seeing them develop slowly. You have a really nice variety of scraps. So nice that they have come out to play instead of hiding in bins! You've got a great start on your scrap projects. I like those shirt strips too, very pretty blues. I adore your shirting strips! Those small squares are pretty wonderful, too.